Many of us used construction paper, glue, and tape to express our creativity in our youth. Tapigami’s minimalism drops the paper and glue, practitioners of the art stick to tape. It is an accessible everyday material so there is no barrier to entry to start having fun. And while tape does have some obvious limitations, it is possible to get quite creatively elaborate and still use tape almost exclusively. The Tapigami booth is very happy to accommodate those wishing to learn the way of tape. At their table, young and old alike are welcome to sit down and start building basic shapes out of masking tape. This begins with cones, cylinders, and cubes which are then combined into more complex creations — it’s kind of like OpenSCAD, but all with tape. 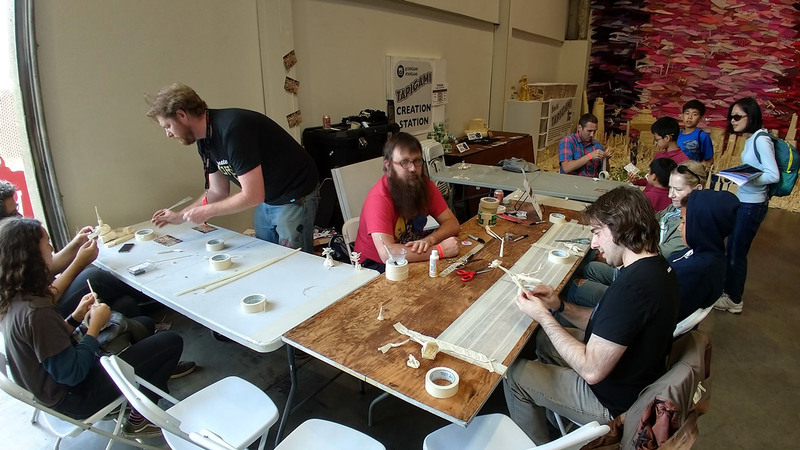 Attendees of Bay Area Maker Faire should not miss seeing Tape City in person, it’s quite the sight to behold in the south-east corner of Zone 2. (Not far from the Tindie/Hackaday booth, stop by and say hi!) And while it’s plenty of fun to stick to tape, we can see the Hackaday demographic taking these concepts up a few notches. If you’ve pulled off something mind blowing using tape, you know where our tip line is. This Weekend: Hackaday x Tindie Meetup At Bay Area Maker Faire. Maker Faire Bay Area is this weekend, and the Hackaday and Tindie crew are getting ready to jack some cupcake cars. The Bay Area Maker Faire is one of the greatest gatherings of all the cool people we know, and five years ago we started host a meetup. This Saturday, we’re blowing the roof off our favorite joint in San Mateo yet again. Join us at O’Neill’s Irish Pub for the 5th annual Hackaday x Tindie BAMF Meetup! This meetup is a well established tradition — it’s all the cool kids at Maker Faire, hanging out in a bar. Well, all the cool 21+ kids that is. There will be blinky, there will be bring-a-hack, and there will be the people who build stuff and make things happen. This is the mixer for everyone who is passionate about hardware, and a refreshing escape from the heat and the five dollar bottles of water. Want an idea of what’s in store for the Hackaday x Tindie Bay Area Meetup? Last year it spilled into the streets. We cajoled [Josef Prusa] to head out, we had tiny 3D printers in action, [Ben Heck] made an appearance, and someone brought a HoloLens. the MOnSter 6502 was there, slowly increasing its program counter. If you want to see the coolest DIY hardware without the dealing with the masses at Maker Faire, this is the event you want to hit up. But wait, there’s more: HDDG is Thursday! Are you heading to San Fransisco early? Awesome, because we’re also hosting the Hardware Developers Didactic Galactic on the Thursday before the Faire! The HDDG is our monthly expand-your-mind gathering for hardware developers in the Bay Area. We have some amazing guests that will be talking about the latest hardware they’ve been developing. On deck for this installment of HDDG is [Tanya Fish] who has been working at Pimoroni for the past couple of years. She’ll be discussing the ‘invisible magic’ of electronics and how to explain electrons to the uninitiated. Also on board for HDDG is [Roy Jui Liang Hung], the founder of Perkūnas Studio, one of the most renowned 3D printing experts in Taiwan. He’ll be talking about 3D sculpture. Also on board is [Jason Kridner], co-founder of BeagleBone.org, who will be talking about simplifying hardware design with the BeagleBone On A Chip. [Eric Schlaepfer] tends to turn up to Maker Faire with projects you simply don’t want to miss. This year is no different. Twelve months ago we delighted in seeing his 6502 processor built from an enormous reel of discrete MOSFETs. At the time it was freshly built and running random code to happily blink the LEDs reflecting activity in the registers. This year he’s given that blinking meaning and is running real programs on his Monster 6502 processor.